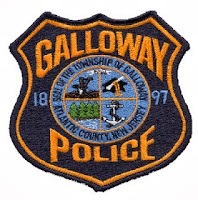 Galloway Township Police responded to 796 calls for service during June 15, 2014 through June 21, 2014. Additional statistics include: 4 Burglaries, 11 Motor Vehicle Accidents, 77 Tickets issued, 2 Driving While Intoxicated, 35 Arrests, 9 Domestic Violence, 14 Fire Calls, 75 EMS Calls and 3 Juvenile calls. Kyrell H Palmer, 22, of Neptune was arrested by Ofc Kyle Kuhar on 6/15 for Manufacturing/Distributing CDS, Possession of 50 grams or less of Marijuana, and Possession of Drug Paraphernalia. Margaret A Adkins, 38, of Hamilton Twp was arrested by Ofc Ronald Gorneau on 6/15 for DWI. William R Kerstetter, 63, of Marathon, FL was arrested by Ofc Dominic Fabrizio on 6/15 for Criminal Mischief. Neysha M Goyco, 29, Mullica Twp was arrested by Cpl Jerry Houck on 6/16 for DWI. Robert S Linsalata, 31, of Galloway was arrested by Ofc John Mooney on 6/16 for Hindering Apprehension. Joseph J Klapatch, 18, of Galloway was arrested by Det Bryan Casey on 6/17 for Under Age Drinking. Thomas P Brogden, 26, of Mullica Twp was arrested by K-9 Sgt Mark D’Esposito on June 20 for Possession of CDS. Tristan Wright, 26, of Galloway was arrested on 6/20 by Ofc Matt Worth for Criminal Mischief. John Marmaduke, 21, of Galloway was arrested by K-9 Sgt Mark D’Esposito on 6/21 for Defiant Trespass. John C Brogden, 20, of Galloway was arrested by K-9 Sgt Mark D’Esposito on 6/21 for Defiant Trespass. Gabriel Louis Jordan, 18, of Absecon was arrested by Ofc John Mooney on 6/21 for Criminal Trespass. A 16 y/o male, of Galloway was charged with Underage Drinking on 6/17 by Det Bryan Casey. A 17 y/o male, of Galloway was charged with Burglary, Criminal Mischief, and Assault of an Officer, Obstructing Justice, Underage Drinking, and Possession of 50 grams or less of Marijuana, Possession of CDS, and Possession of Drug Paraphernalia on 6/17 by Det Bryan Casey. A 17 y/o male, of Galloway was charged with Criminal Trespass and Possessing a Weapon on 6/21 by Ofc John Mooney.